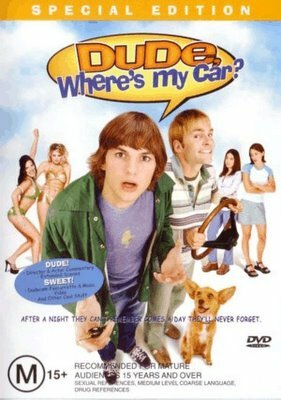 I'm watching one of my favorite movies: "Dude, Where's My Car?" Go ahead -- have at me. If you're into goofy stoner flicks, there are way better examples of the genre. Try "Super Troopers" or "Harold and Kumar Go to White Castle." WOW! Father, I watched this movie a few summers ago for Jesus. A high school kid from my roommates ministry showed up at our apartment with it one summer day. It was entertaining, but not something I would seek out. I'm glad you put this out there because it makes it easier to identify with you as a real person. "Protestant" to Catholicism I have put a great deal of my faith in the authority of the priesthood. The spiritual authority goes against my previously held beliefs and is not something I fully understand in my heart. I have a lot of questions about Catholicism, but they are not really apologetic. They are more about style and form. They are very hard to articulate. But you have helped me articulate one. Are priest allowed to show a human side? Are they allowed to show imperfections? Or is that something handled amongst their fellow priests? The answer I assumed and seems to be yes. A priest is a normal guy, just like me, with more responsiblity. A lot of responsibility actually. If I'm wrong, please set me straight. I really must see this some time. I'll probably like it. And the phrase has become part of the lexicon...Our parking at work (i.e. also my parish church) is so wacky that I use the phrase about once a week.